Pat and the Sniper’s snappy cousin | Stand, spray and deliver. THIS PIECE COMES WITH A WARNING FROM ELD 2.0: SOME IMAGES BELOW MAY CAUSE YOU TO GRAB YOUR LEG AND DO THAT PAINFUL GRIMACE FACIAL MOVEMENT THINGY. Last week’s piece entitled Footy Snipers highlighted the actions of the callous individual in the crowd who brandishes a silent pistol and paralyses with the steady hand of a surgeon. I’m here to tell you that he’s no Robinson Crusoe when it comes to being fond of inflicting the need for the occasional x-ray and moon-boot. On the weekend just gone, I spotted the sniper’s more unsightly and imprecise cousin who invisibly walks amongst those on the pitch and who strikes irregularly but with horrendously graphic results every time. He’s the curious spirit who likes to test the strength and resilience of tenticles that aren’t meant to bend, snap, displace and crumple, usually by bending, snapping, displacing and/or crumpling them. The jury is still out on what moniker the perennial season-ender operates under. There's a present in that box. This week's dog meat. The Clean Break Guru? The Hyper-extender? The Dislocation Overlord? Magic Green Whistles Inc’s major shareholder? Whatever he may be labelled, just pray you aren’t tucking into dinner or fighting a hangover when he strikes. He was spotted across the Tasman on Saturday night at the Highlanders v Waratahs clash in Dunedin. As Pat McCutcheon charged down a kick and regathered on his way to the stripe for a Waratahs try, he was desperately tackled from the side by a Highlanders defender. I’ll let Pat explain what happened next. For those having trouble manufacturing the image in your mind, it means that his body was facing steadfastly north and his ankle was pointing to the west on a right angle. Going off the last time I checked a medical journal, I’m pretty sure the bone assembly of the human leg is not meant to rest in such a fashion. That's the worst mozzie bite I've ever seen! The crafty Manipulator of Marrow was also out and about in Melbourne a few weeks back at the NAB Cup fixture between Carlton and the Western Bulldogs. Carlton defender Jeremy Laidler launched into a marking contest with Bulldog Will Minson and guess who joined them as third man up? It was the Bone Butcher, obviously on assignment in Mexico to sample the espresso, who stealthily levitated with the pack. 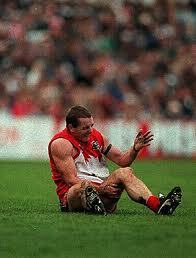 When the bodies collided he crudely repositioned Laidler’s kneecap into a fashionably skewed location on the left side of his leg which wouldn’t have looked out of place in one of Melbourne’s many trendy abstract art galleries. That resulted in approximately 2000 hot dogs being instantly refunded by the spectators at Etihad Stadium as communal nausea kicked in. 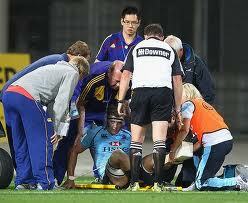 So can you remember any other times that the Medicab Master has paid your favourite player a visit? I just vomited on the keyboard. Seriously. Who could forget Daryn Cresswell famously taking on the role of team doctor as he attempted to use neanderthal fundamentals to restore normality to his knee after a visit from the man in question? What about Drew Mitchell performing one of rugby’s greatest party tricks when he tried to scratch his own back with his toes by turning his ankle in the opposite direction of forward? Who recalls the occasion when Scott Prince watched his lower leg continue to flail in the kick follow-through after booting the footy downfield in his early days for the Brisbane Broncos? All these of these memorable mangling moments and more are thanks to the Sniper’s cousin. Leave your cherished memories of stomach-churning appendage annihilation below! Posted in What do you think?